Despite enormous reductions of their nuclear arsenals since the Cold War, the United States and Russia retain more than 9,100 warheads in their military stockpiles. Another 7,000 retired – but still intact – warheads are awaiting dismantlement, for a total inventory of more than 16,000 nuclear warheads. This is more than 15 times the size of the total nuclear arsenals of all the seven other nuclear weapon states in the world – combined. The U.S. and Russian nuclear arsenals are far beyond what is needed for deterrence, with each side’s bloated force level justified only by the other’s excessive force level. 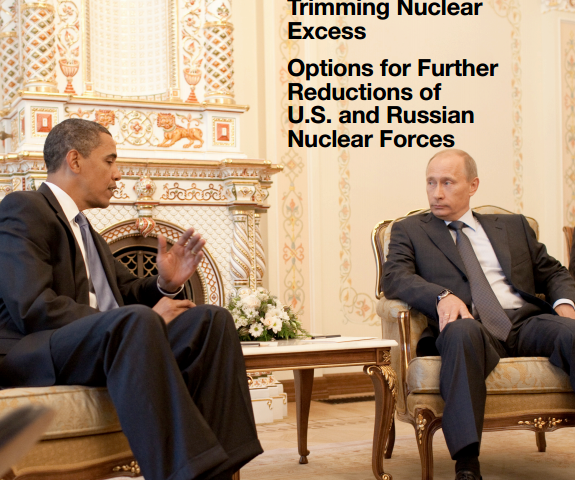 The FAS report – Trimming Nuclear Excess: Options for Further Reductions of U.S. and Russian Nuclear Forces – describes the status and 10-year projection for U.S. and Russian nuclear forces. The report concludes that the pace of reducing nuclear forces appears to be slowing compared with the past two decades. Both the United States and Russia appear to be more cautious about reducing further, placing more emphasis on “hedging” and reconstitution of reduced nuclear forces, and both are investing enormous sums of money in modernizing their nuclear forces over the next decade. Even with the reductions expected over the next decade, the report concludes that the United States and Russia will continue to possess nuclear stockpiles that are many times greater than the rest of the world’s nuclear forces combined. New initiatives are needed to regain the momentum of the nuclear arms reduction process. The New START Treaty from 2011 was an important but modest step but the two nuclear superpowers must begin negotiations on new treaties to significantly curtail their nuclear forces. Both have expressed an interest in reducing further, but little has happened. New treaties may be preferable, but reaching agreement on the complex inter-connected issues ranging from nuclear weapons to missile defense and conventional forces may be unlikely to produce results in the short term (not least given the current political climate in the U.S. Congress). While the world waits, the excess nuclear forces levels and outdated planning principles continue to fuel justifications for retaining large force levels and new modernizations in both the United States and Russia. To break the stalemate and reenergize the arms reductions process, in addition to pursuing treaty-based agreements, the report argues, unilateral steps can and should be taken in the short term to trim the most obvious fat from the nuclear arsenals. The report includes 32 specific recommendations for reducing unnecessary and counterproductive U.S. and Russian nuclear force levels unilaterally and bilaterally.